I may be a day late and a dollar short, but I want to share my homemade Christmas with you! I plan on posting something everyday that we have made for Christmas. Some might be kids crafts but some of them are going to be presents. So I think I will have to call my Mom and Sister and ask that they don't look at my blog until Christmas. They aren't regular readers anyway but, I might need to ask just in case. So for the first day I am excited to post one of the things we made for my parents. It is an apron where we used the kids footprints to make snowmen. My friend was telling me about how she had seen this on one of the local morning shows. I have no idea what theirs looked like, but I happen to be in love with mine! 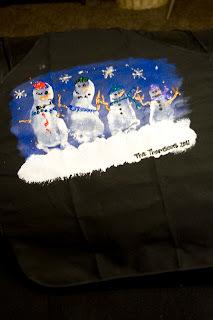 I bought the apron at Wal-mart for a few dollars and I have a huge stash of puffy like paints. I just squeezed some of the pain out into a disposable cup and painted the blue and white. I let that dry and Monday night for Family Home Evening Josh helped to make footprints of our crew. 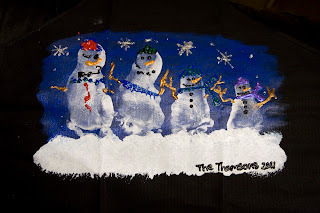 That night I pained the twins but the following morning Max and Turner made their footprints into snowmen. Did I mention that I loved how it turned out?? I might have to print off one of these pictures and frame it to add to our holiday decorations. What are some fun things you are making for Christmas? I really like this! Trying to decide if it's something I could pull off. I'm on the nothing handmade, I'm too late Christmas plan. Super cute! I saw a cute Christmas tree out of foot prints I think I am going to try out with my newest nephew. I know it was the last post but I wanted to leave you a note about motivation. I think it is awesome that you are making fitness goals. Something that helped me with my fitness goals, specifically running, because I never thought I could be a runner, I thought you either were or were not a runner, and I figured for a lot of years that I just wasn't, like you were skinny, or you weren't, but I realized that I was making excuses for myself. I had a really good friend who is an excellent runner tell me that for the first mile she always feels like she is going to die, and when she gets past that she starts to feel better. I would quit every time after a few weeks into my goals because I thought that I should LOVE running and that it should be easy if I just kept it up. It was like a switch flipped once I heard her say that it was still hard for you, that it isn't about being fantastic at running, it is like so many other things in life, it is about keeping going and being consistent. I talk myself out of so many things because it is not easy, but it is important and valuable, like reading my scriptures and saying my prayers everyday, and as the Mom we think we need to take care of everyone else, but we need to take care of ourselves so that we can be the best for our family. I hope that you keep going, it won't be easy, but you are worth it and I know you can do it. Keep up the great work. That's so cute! I love it! Way to go on running today too. Maybe I need to try to start running. If you can do it with your crazy life then I should be able to do it! I love it even better then the one I saw on TV. So Cute! 2 down 11 to go! I don't ever do this! Enjoying a great December day! What a girl can learn in 86 hours!